Miss Nouran is a member of Sea Serpent Fleet. 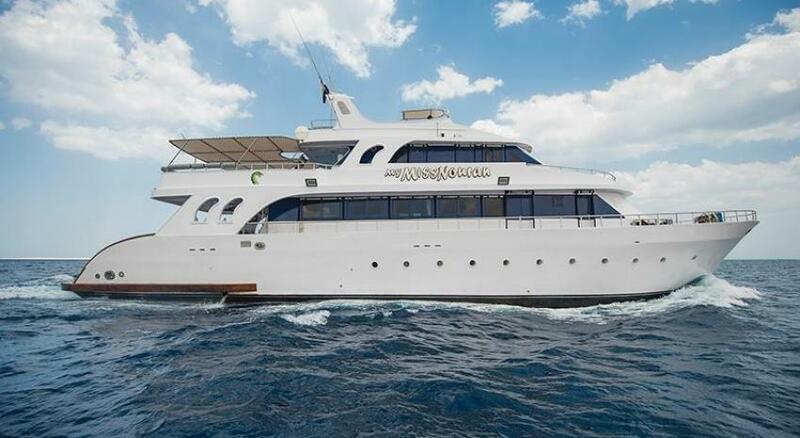 Boat was built in 1996 and since then she offers to discover the marvelous Red Sea. A number of cabins on a board of Miss Nouran are 10. They can accommodate 20 passengers. All cabins equipped with twin beds that means they can be shared. Rooms have air conditioning and en-suite bathrooms. Boats lounge zone is large. It has comfortable sittings, a dining area, and entertainment system.Miss Nouran’ guests can stay there in between dives, and evening chatting with each other o watching TV. Another common area of Miss Nouran is sun deck. It is also equipped with sofas. You can perfectly relax under the shade or enjoy the sun at its open part. Big dive deck of Miss Nouran has comfy benches for preparation for dive, storage boxes, hangings for wetsuits. There is a Nitrox membrane a rebreather facilities. One of the most important things during the safari is safety. Miss Nouran crew cares about your safety, boat equipped with life vests and emergency rafts, fire fighting equipment, radar, and echo sounder. Miss Nouran itineraries include visiting of the most attractive dive spots of Egypt, Brother Islands, Daedalus and St. Johns. Brother Islands is a vast of coral formations. Multicolored Reefs and walls of this dive site are truly amazing. They attract lots of marine creatures like whitetip and thresher sharks. While diving at Big Brother two wrecks can be seen. Aida and Numidia can be explored during the safari. St. Johns is a southern part of Red Sea, Diving here features with a strong chance of meeting hammerheads. This pelagics are frequently seen here as well as other types of sharks. You can dive along the walls, visit coral gardens. Also St. Johns is ideal for underwater photographers. Diving in Egypt available all year round. Best conditions are in Spring until the middle of Summer and then From the Autumn months till December.